Let us knit. Wait, I mean, Knit lettuce! Not very much of it so far—but pretty. It's Lucy Neatby's Sea Lettuce scarf—only its not. Which is to say: I saw, and I copied. I didn't buy the pattern, but it is her pattern none the less. There is a major disadvange to not buying the pattern —I have no idea what the results are going to be! And 2—since I am just copying, and not working to an exact count (stitch count) or an exact gauge (I just tried a few sizes of needle till I found one that gave me the fabric I liked) – I have only a vague idea of what my end result will be. I am am working totally blind! So—like reckless women everywhere, who burn the candle from both ends—I am working from both ends of the skein. This way, what ever the end result, it will be matching! Currently the out side end of the skein is longer bit of the scarf--(4 inches +end ruffle) The inside end is just 3 inches long--and I am about half way done with the yarn--(I am guessing!) At this point, I will alternate, inch by inch each end of the scarf. If I am a the half way point in the skein-- I can knit 7 more inches. Or 14 inches in all. That is way to short—but.. the end ruffles? They used up yarn with out adding inches. They have the same short row wedges.. (5 on each end) that 5 pairs (or about 4 inches.. so maybe, the 14 inches will extend to 18 inches.. short.. but OK I think. Maybe I'll knit the back few inches flat (no short row ruffled edges.. that would add an inch or two.. Maybe a 20 inch scarf. 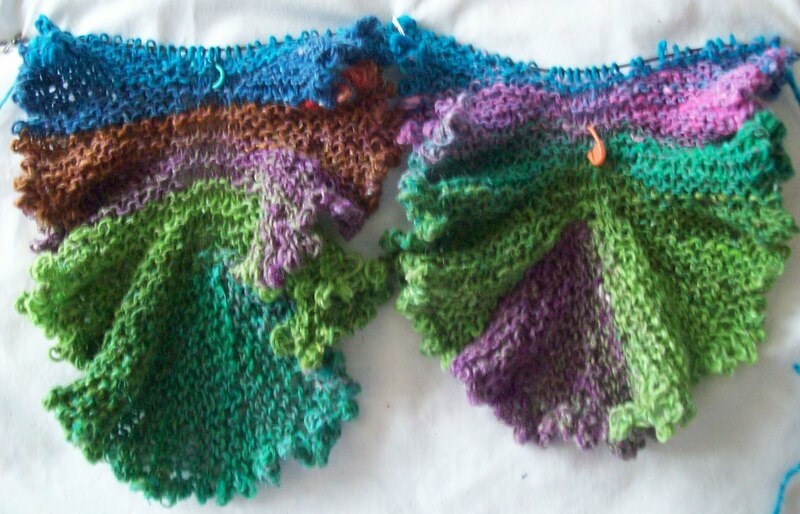 The colors are pretty, the ruffles are pretty, the scarf—short or long will be pretty, too. I am actally surprized at how much I have knit in the past 3 days—considering I mostly slept. I am at the back side of my cold now, and maybe the pace will pick up a bit.. Very clever of you to work from both ends of the skein! Actually, the major disadvantage is that the designer didn't get paid.